JUN 18, 14 .. THERE IS A SONG .. WE ARE THE CHAMPIONS ! ! Our local professional Ice Hockey Team .. the Alaska Aces .. are members of the Western Conference of the East Coast Hockey League (ECHL). The ECHL is divided into two separate conferences .. the Eastern Conference and the Western Conference. The goal for the teams in the ECHL is to win the Patrick J. Kelly Cup .. the trophy signifying the best team in the ECHL. To win the Kelly Cup .. a team must first qualify for the Kelly Cup Playoffs. The teams who qualify for the Kelly Cup playoffs must then win four individual elimination series consisting of winning four games in each seven-game-series .. called a best-of-seven format. Our Alaska Aces qualified for the Kelly Cup Playoffs by winning the Western Conference Championship of the ECHL. Next our Alaska Aces won their first playoff series (4 games to 0) against the Las Vegas Nevada Wranglers. The Aces then went on to win their second playoff series (4 games to 1) against the Idaho Steelheads. The Aces then went further into the playoffs by winning their third playoff series (4 games to 2) against the Bakersfield California Condors. Having won their first three playoff series .. our Alaska Aces then advanced to the KELLY CUP FINALS. On Friday .. May 30th .. the Aces met the Cincinnati Ohio Cyclones here in Anchorage Alaska at our Sullivan Arena to begin a final best-of-seven series to determine THE CHAMPIONS .. the winners of the Patrick J. Kelly Cup and ECHL CHAMPIONS. Patti and I attended each and every playoff game that was played here in Anchorage Alaska during this years 2014 Kelly Cup Playoffs. Below are a series of photographs taken during the three home games here in Anchorage Alaska between our Alaska Aces and the Cincinnati Ohio Cyclones. Each and every game begins with the showing of our United States of America Flag and the singing of our National Anthem .. The Star Spangled Banner. Now it is time for some Ice Hockey! Our Alaska Aces won game 1 of the series with Cincinnati. Shortly after I snapped the below photo the Aces scored an empty-net-goal to make the final score 5 - 3. Our Alaska Aces lost game 2 of the series with the Cincinnati Cyclones by the score of 2 - 1. So after two games the series was all tied-up at one game apiece. Below are some game 3 photos. Game 3 was the last game of the season played here in Anchorage Alaska. Below is a close-up photo of three Cincinnati players showing their uniforms. The player on the right is the goal-keeper also called a goalie. Notice the large pads on his legs. In the immediate foreground of the below photo .. player number 39 is our Alaska Aces 'goalie' guarding-his-net! And our Alaska Aces WON game three of the series! Now we know .. in a fairly 'tense' series of six games .. played in a format of three games in Anchorage Alaska .. and the next three games in Cincinnati Ohio .. with a final seventh game if necessary to be played back in Anchorage Alaska. WE ARE THE CHAMPIONS OF THE ECHL! OUR ALASKA ACES ARE THE PATRICK J. KELLY CUP AND ECHL CHAMPIONS !! 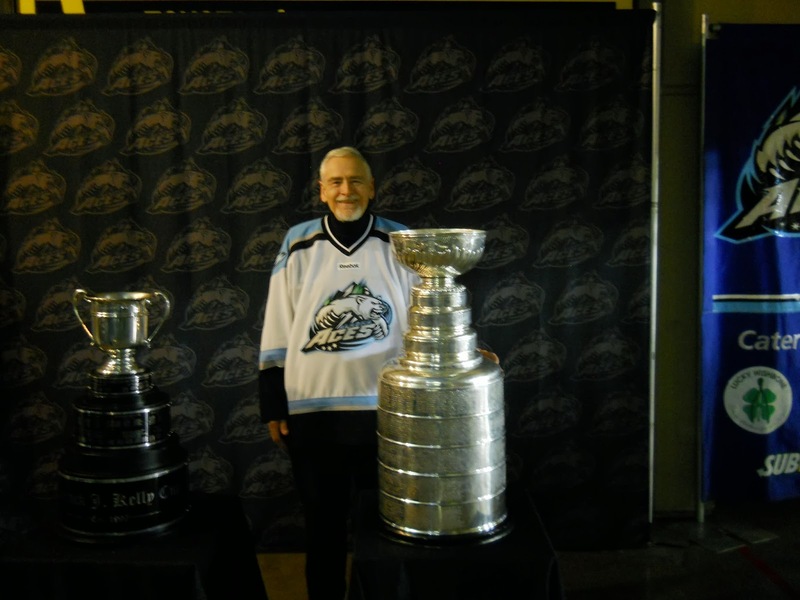 When the Alaska Aces returned to Anchorage Alaska after winning the Kelly Cup and the ECHL Championship in Cincinnati Ohio we all enjoyed a GREAT CELEBRATION here at our Sullivan Arena! Talk-about-a-line to enter the Sullivan Arena! Oh yes .. it was not long ago that it was WINTER here at the Sullivan Arena! Can you all believe IT! Below is the Sullivan Arena with the ICE melted and the ice hockey rink put-away-for-the-summer! 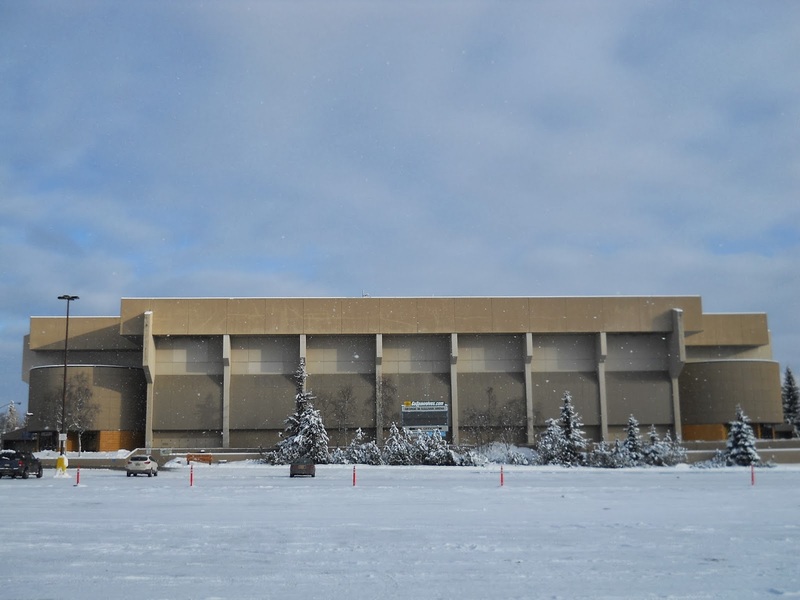 Just look at it .. the Sullivan Arena looks naked-and-empty! Can you all relate the above and the below photographs to each other? It is difficult to do isn't it! Below is a photo of the two Zamboni's used to resurface the ice during the games .. sitting on a concrete floor! And below you see the above two Zamboni's at work re-surfacing the ice between periods at a game earlier! What a difference! Sorry-to-note but the lighting was on the dim-side and so the below photographs are 'blurry' since I had to hand-hold my camera at a slow-shutter-speed. But you get-the-idea. All of the players were sitting together while speeches were made and the fans CHEERED LOUDLY for OUR ALASKA ACES THE CHAMPIONS OF THE ECHL AND WINNERS OF THE PATRICK J. KELLY CUP! Well there-you-have-it loyal readers and followers of my web site. Below is a photograph taken earlier in the season during a special event at an Alaska Aces hockey game. To your left as you look at the below photograph is the Patrick J. Kelly Cup to signify the champion of the ECHL. To the right as you look at the below photo is the STANLEY CUP that signifies the winner of the National Hockey League (the NHL) Championship. As our Alaska Aces were winning the Kelly Cup up here in Alaska .. our good friend and loyal follower down in Southern California .. was rooting his LOS ANGELES KINGS ICE HOCKEY TEAM to victory and their winning of the STANLEY CUP! Let's hear it for 'ZILLA! .. And for the Los Angeles Kings! In closing I realize that I have been on-again and off-again lately with my web-site here. Mostly off-again. THANK YOU ALL SO MUCH FOR 'HANGING-IN' WITH ME. With much Joy and many Happy Thoughts to you all .. Cap .. Please note .. lately it has been several weeks between each post. As a result of this .. you may stop reading here at the end of the above post thinking that 'this-is-it' for now. YESTERDAY .. 17 JUNE 2014 .. I posted a very special (second) post about D-Day with special memories sent-to-me by my friend-from-France .. Clement. SO IF YOU HAVE NOT ALEADY READ YESTERDAY'S POST .. PLEASE CONTINUE DOWN to enjoy yesterday's post. JUN 17, 14 .. D-DAY REVISITED BY MY SPECIAL FRIEND FROM FRANCE .. CLEMENT ! Those of you who have been 'following-along' with me here for any considerable length of time .. assuming your memories are relatively intact and fairly functional .. you may recall that I have mentioned my friend Clement-from-France and his family .. in a number of posts. I met Clement in Ladakh .. a large geographic area located in the extreme North of India .. in mid-August of 2008. The below photo was taken with Clement in Royal Oak Michigan last July of 2013 when Clement and his family visited Patti and I as they began their major and on-going trip to South America. Clement has a phenomenal web site that you can easily access by clicking-onto the LINK TO - CLEMENT'S BLOG on the right of this post. I am so happy that you asked me 'Zilla! The D-Day landing came ashore on the beaches of Normandy France .. Clement's homeland. In response to my post dated 6 June 2014 about D-Day and the 70th Anniversary thereof .. Clement sent to me an e-mail that DEEPLY touched my very soul! Allow me to share it with you (with Clement's full permission) first in Clement's native language French followed by the Google Translation into English. J'ai été particulièrement heureux de lire l'article de Cap sur le 70e anniversaire du Jour J.
Je me souviens des longues heures passées à écouter mes parents raconter les moments vécus pendant la guerre et après le débarquement. Lors de leur avancée, les Alliés sont restés bloqués plusieurs semaines au bord de la Moselle, affluent du Rhin. La maison familiale à Florange, près de Thionville, avait été choisie par les soldats américains pour installer une batterie antiaérienne... au fond du jardin, à une vingtaine de mètres de la maison. Nous étions tout près de la gare et l'endroit était parfait pour protéger les convois ferroviaires. Un officier est venu demander à ma mère si elle voulait bien faire à manger pour ses hommes. Elle a accepté avec joie et cuisiné pour une quarantaine d'hommes pendant plusieurs semaines, les Allemands restant accrochés sur l'autre rive de la Moselle. En échange de ce travail, les soldats ont fourni de la nourriture supplémentaire que ma mère a pu distribuer à tous nos voisins de la rue. Cela a été un grand réconfort pour tous et payé ma mère de la fatigue dûe à cette charge de travail supplémentaire. Ma mère a été traitée avec respect et gentillesse par tous ces jeunes venus des USA. Elle nous en a toujours parlé avec chaleur ! Mes parents racontaient que les soldats riaient de voir ma grande soeur, née deux mois avant le Jour J, courrir dans son petit trotteur monté sur feutres qu'elle faisait glisser sur le parquet. Le débarquement, ça a été la Libération. J'espère que la guerre, finalement, s'arrêtera partout dans le monde. La Paix pourrait devenir la seule religion. "What's that 'Zilla? You are not able to read French?" As I read Clement's e-mail .. and as I re-read it again above .. I am teary and choked-up. Clement's parents LIVED the D-Day Invasion and the events that followed D-Day. THANK YOU SO MUCH CLEMENT FOR SHARING THIS WITH ALL OF US. Your Ally .. Cap ..
JUN 6, 14 .. D -DAY .. The 70th Anniversary of D - DAY ..
JUNE 6th here in the United States is known as D - DAY and it is one of our famous dates in our history. On June 6th .. 1944 .. World War II Allied Forces landed on the beaches of Normandy in France in the largest amphibious military landing in the history of the world. In humble honor of D - DAY I salute all of those who took part in this enormous invasion .. many of whom gave up their lives on those blood-stained beaches of the Normandy Coast. To you who served and to you who died that we may live free .. please know that we honor and that we remember you all! I SALUTE YOU! WE SALUTE YOU! 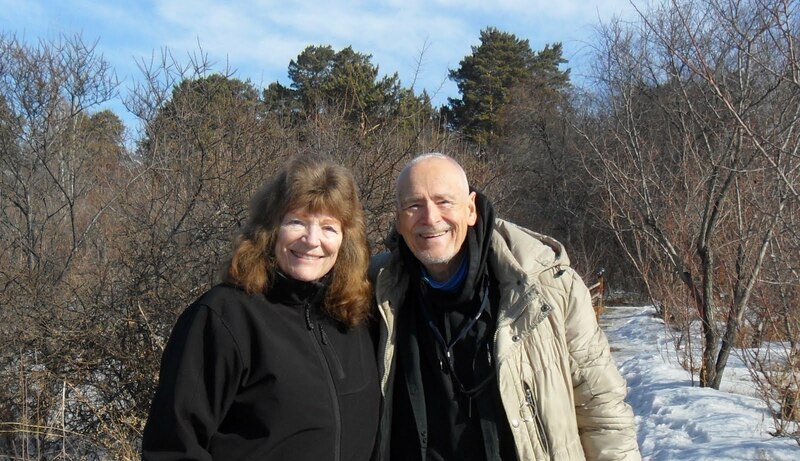 Patti and I thank you for your sacrifices and for our freedom to live in such a beautiful place .. Anchorage Alaska ..